Good teacher... or intolerant judge... or children's story... Who is Jesus? 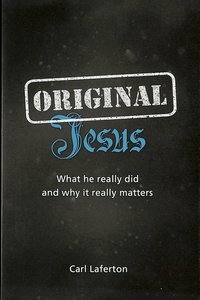 This is a book about 'Original Jesus' - the one who actually lived in human history; the one who often gets hidden behind all the other versions of Jesus we're offered; the Jesus who is controversial, compassionate, sometimes uncomfortable, often unpredictable... and completely real. Short, funny, friendly and easy-to-read, Original Jesus looks at seven episodes in Jesus' life from the Gospel of Luke, and explains how Jesus really matters today and how his life can transform people's hopes and futures. Perfect for giving away to non-Christian family and friends, whatever their view of Jesus, and for handing out at church outreach events. What he really did and why it really matters. Carl Laferton is Senior Editor at TGBC. He is author of Original Jesus, Promises Kept and Christmas Uncut, and series editor of the God's Word For You series. Before joining TGBC, he worked as a journalist, a teacher, and pastored a congregation in Hull. Carl is married to Lizzie and they have two children, Benjamin and Abigail. He studied history at Oxford University. 0 Available. Expected to ship in 3 weeks from Australia.